The popularity of making and registering an NFA firearm has exploded in recent years. This is a great way to enter the NFA market and make things like short barreled rifles, short barreled shotguns, and suppressors. The overall process is fairly simple, but a key component of the process is engraving the firearm you are making with your information. This is required even if you are making an SBR from an existing firearm such as an AR15 lower. It must be marked with your name/city/state or trust name/city/state. 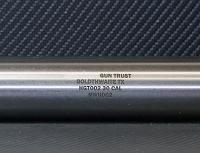 For suppressors you will need to mark the full identifying marks found on firearms including serial number, model, and caliber. There has never been a better time to get into the NFA game so get your build started today.